We specialize in the development of business applications and multimedia educational software. We provide advanced custom UNICODE solutions for converting Arabic language study materials and text book to interactive multimedia applications. We do a complete project design and development for multi-platform use as well as we provide training. Click on the button below to contact us for your upcoming school project. Specializes in the development of business applications and educational software, and provide custom UNICODE solutions for converting Arabic language study materials and text book to interactive multimedia applications including complete project design and development for multi-platform and training. Overview: Pearlink Software was founded in 1995 as a developer of business applications and educational software. 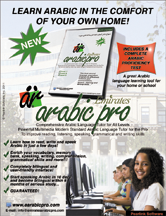 The company first release a major Arabic language tutoring software, namely My Arabic Teacher v2.1 for the Macintosh platform. Several upgrade versions of the original release for the Macintosh platform. In 2002, the company release the first Windows version for PC namely Mualimi v5.1. Other software developments included Al-Khattat Arabic word processor, The Young Designer (Ar-Rassam as-Sagheer) a graphic design application for young children, and WAU, a database application for businesses records keeping, among others. Need custom development for your school!